Read here about bicycles and their significance in tensegrity modelling and structures. See also Bicycle wheel. A bicycle is the most efficient mode of transportation, in terms of energy conversion efficiency from a human to mobility. Part of this efficiency results from its structure, resulting from an efficient deployment of tensile forces requiring, as a result, minimal mass. But a tensile structure is not a tensegrity. 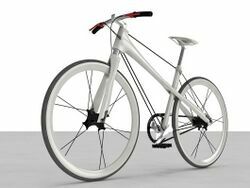 Though some bicycles have appeared with “statically determinant” cables deploying tension in one plane, and for one triangle of the frame, there is no bicycle yet available that deploys omnidirectional tension. That said, the bicycle is historically important to tensegrity studies. The bicycle wheel is an important inspiration for tensegrity in Fuller's work. Flemons recently rendered one as a tensegrity torus. See bicycle wheel. The bicycle also remains one of the most lightweight and efficient tools for transforming human muscle energy into rotary motion. 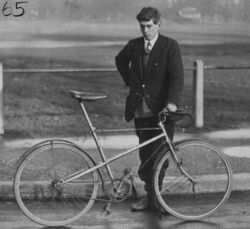 The oldest photo of a 'cross' frame with tensioned cables in place of top tube, down tube, chain stays and seat stays. It seems that the cables are stressed by the use of bottlescrews. It is a Fletcher-Kain by Jimmy Kain, a founder of the British League of Racing Cyclists and a noted trader in his day (Cyclist's Equipment Co at Ealing), latterly a Chelsea Pensioner. Mark Groendal implemented this design on his Slingshot bikes. They had a mid-suspension frame articulated by means of a stainless steel cable. The cable attached to the coil spring and the bottom bracket, the cable links the front and rear frame components. Slingshot claims a benefit of the spring, cable, and fiberglass board relationship is that the Slingshot frame has the potential to turn every bump in the trail into forward motion. Every bump becomes a boost. This is achieved by utilizing the same stored energy concept explained above - with the added feature of the mid-suspension fiberglass board. When the rider hits a bump in the trail, the front of the bike will absorb the shock by compressing the spring and flexing the fiberglass board (suspension), temporarily increasing the bikes wheelbase. When the bike returns to its normal state, the Slingshot redirects the forces of trail shock into forward motion. Bicycle with callouts, by Mark Groendal for Slingshot bicycles. Diagram from www.slingshot.com. Mark left Slingshot in 2000 to work with Robert Shook, a retired aerospace engineer from McDonald-Douglas, and together they created the Energy Return Bicycle System- the driving technology of the Erb bicycle. Ionut Predescu of Yanko Design recently released similar designs, naming it a tensegrity bicycle. Tensegrity Bicycle by Ionut Predescu. This page was last edited on 18 November 2018, at 13:05.